An excerpt from the book 'Chasing the Affordable Dream: A Plan to House Mumbai's Millions'. Mumbai is characterised by some of the most expensive real estate in the world – properties in prime locations have sometimes fetched a price of Rs 1.2 lakh per sq. ft. (Economic Times, 2015). In this regard, the city has been under siege by real estate agencies – landowners, builders and developers who have dictated realty prices. The high prices in the market coupled with the failure of the government to regulate supply of land (for further elaboration on this see section on Exclusionary Planning) for affordable housing and civic infrastructure has resulted in a situation where the underprivileged have consistently been bundled out of the formal housing market. Two data points are presented in Figure 6: Median EMI to income ratio and Median house price to income ratio. 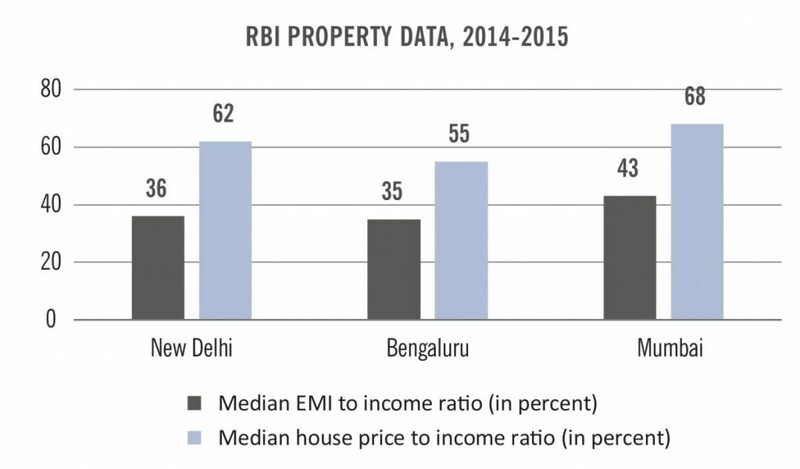 The median EMI to income ratio measures the percentage of monthly income that a household spends on EMI for its housing loan; on average this percentage is significantly higher for Mumbai than New Delhi and Bengaluru. Median EMI to income ratio and Median house price to income ratio. Small: Properties of size less than 750 sq. ft. Medium: Properties of size between 750 and 1,200 sq. ft.
Large: Properties of size greater than 1,200 sq. ft. 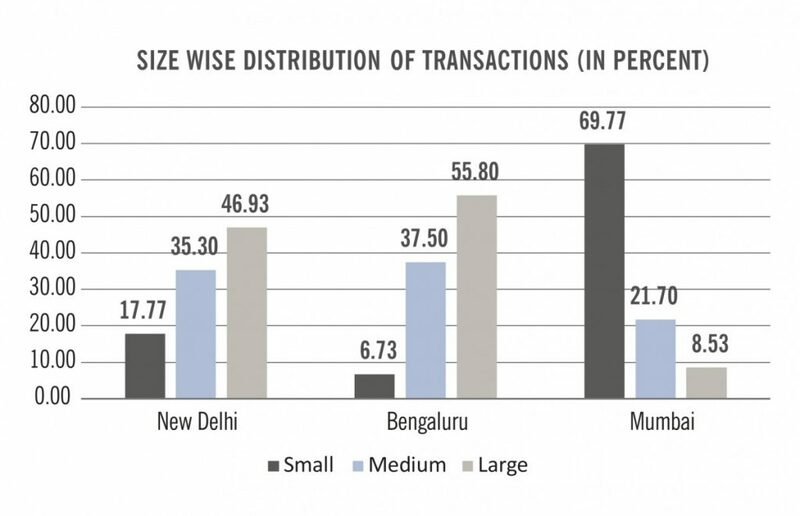 In Mumbai, as many as 70% of home-buying transactions are for tenements below 750 sq. ft., as compared to 18% and 7% for New Delhi and Bengaluru respectively. To add to the dense and overcrowded living conditions in Mumbai that these figures reflect, it is also the most expensive city to buy a home. A home buyer’s Median EMI outgo is 43% of monthly income and the price paid is nearly 70% of his/her total earnings – a very heavy price to pay for shelter! Within a span of 10 years, the average rate per sq. ft. in Mumbai, as seen in Figure 8 has increased five-fold, rising steadily except for a sudden dip after 2008 on account of the global slowdown. It can be argued that the prices have reached a plateau since 2013. But, even then, at the rate of Rs 21,664 per sq. ft., in 2015 the average price of a 350 sq. ft. tenement in the city would have been over Rs 75 lakh. Such an exorbitant price raises serious questions about accessibility of shelter in the city. At this price, assuming a maximum loan to value of 80%, a rate of interest of 12% and a loan period of 20 years, the EMI would be Rs 62,612. 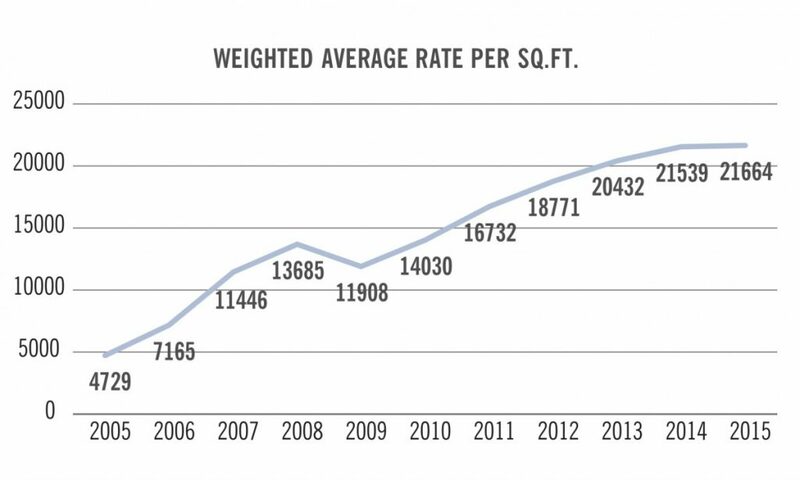 Weighted average rate in Mumbai per square feet. Further, affordability would require that a household spend no more than a third of its monthly income on housing. In other words, the minimum monthly income required to sustain this EMI would be Rs 1,87,836. With the per capita income per month in Mumbai estimated at Rs 15,728 (Maharashtra Economic Survey, 2014- 2015), the average EMI required to purchase a 350 sq. ft. dwelling would be four times more than the per capita monthly income. At these prices, state and central government employees, even to the rank of Chief Secretary, will find it challenging to buy a house. This gives an idea how ‘unaffordable’ the Mumbai housing market is for the poor. It also reflects a failure of the State on two counts; 1) To regulate the inaccessible housing market and find alternatives by generating government, price-controlled stock and, 2) To provide affordable housing to the non-elite masses of the city. Jones Lang Lasalle (JLL), in a study published in September 2015, analysed the size and price of properties which were launched in the second quarter of 2015. The data shows how the affordability problem in Mumbai is much more severe than in the rest of the country. As seen in Table 4, almost 10% of all new properties in India are less than Rs 30 lakh a unit, whereas in Mumbai it is ‘0’, meaning that kind of stock does not exist at all. While 10% itself is not the kind of supply which will help the government achieve its goal of Housing-for-All by 2022, it is still better than the dismal figure of Mumbai. These figures also show how far the real estate market in Mumbai is skewed against the poor. In Greater Mumbai, as many as 83% of dwellings in new launches cost upwards of Rs 1 crore. This reflects how the market is only serving the luxury housing segment and is totally indifferent to the needs of the average Mumbaikar. Drilling deeper, we realise that 23% of the dwellings in new launches are priced in excess of Rs 2.5 crore, as compared to 3% across the country as a whole. One would recall that Mumbai is a city where the per capita income per annum is Rs 1,88,739 (Maharashtra Economic Survey, 2014–2015). That there are no new projects offering homes in the below-Rs 30 lakh category, shows how inefficient, and indifferent too, the Mumbai market is, failing, as it is, to tap the huge pent up demand of the people in this segment. Even in the category of units in the Rs 30 to 65 lakh range. 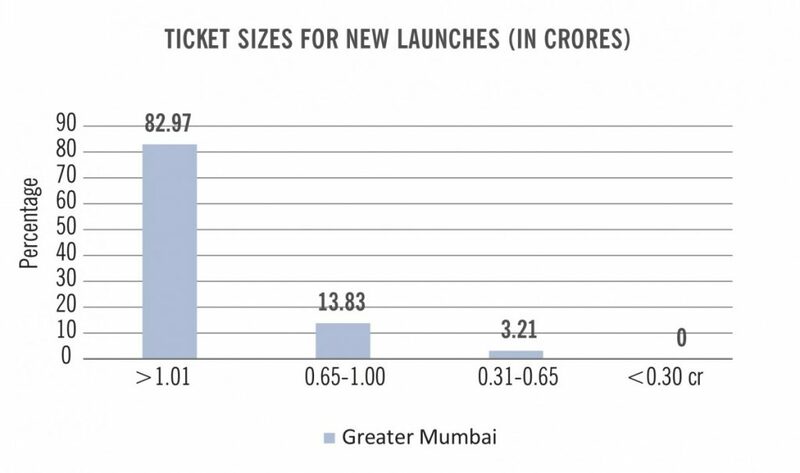 the number of launches on offer is just 3.2%. The only activity is in the semi-luxury and luxury categories, which caters to a very small section of the population. Even if the government intervenes with credit subsidy and cheap loans, there are no homes to buy in Mumbai in the below Rs 50-lakh range! The overwhelming stock sold by private developers even in distant suburbs is priced at above Rs one crore (Rs 10 million). Chasing the Affordable Dream Chasing the Affordable Dream: A Plan to House Mumbai’s Millions by P.K. Das, Gurbir Singh, Ritu Dewan and Kabir Agarwal (Bombaykala Books). The simple fact is that the private building industry sees better margins in luxury housing, and finds marketing this segment cheaper and easier. From a business point of view this can be contested and several builder groups, especially in Pune and many other cities have structured their business plans successfully around constructing ‘affordable’ housing units with a high-volume-low-margin strategy. On the other hand, there is poor demand for luxury housing, and much of this stock goes begging. As per Census 2011, Mumbai has 4.8 lakh vacant houses. It is paradoxical that a majority of the city’s population lives in slums and sub-human conditions, whereas nearly 5 lakh units are lying vacant as ‘investment’ stock. The fact that there is a huge pent up demand for housing at affordable prices is illustrated by a recent MHADA ‘lottery’ in September 2016 for small and middle-sized homes priced reasonably and not at free market rates. For just 4,275 units advertised for sale in locations on the periphery of the city like Mira Road, the government agency received 1.65 lakh applications. The story of a stampede of buyers has been repeated in lotteries and auctions by MHADA in previous years too. The need for shelter is a basic human need and every city must be able to provide its citizens with a safe, secure and affordable home without the constant threat of forced eviction and displacement. The evidence from the data above suggests the failure of the market in providing affordable housing to the citizens of the city. The government on its part has preferred to turn a Nelsonian eye to this unfolding tragedy. 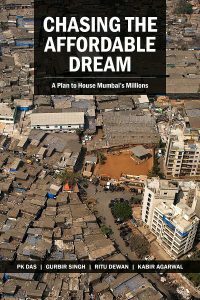 Excerpted with permission from Chasing the Affordable Dream: A Plan to House Mumbai’s Millions by P.K. Das, Gurbir Singh, Ritu Dewan and Kabir Agarwal (Bombaykala Books).